A blocked restriction on oversize soda sales has reached the state's top court. Yep, this again. As of yesterday, the New York Court of Appeals is considering whether to reinstate a ban on supersize sodas, which was overturned by a lower court in March 2013, the same month it was supposed to take effect. 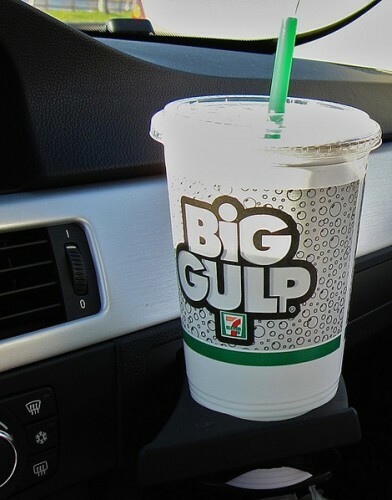 The anti-obesity measure was initially introduced by former mayor Michael Bloomberg and was immensely unpopular; a June 2013 Gallup poll found that only 30% of Americans supported it, while 69% said something to the effect of you can have my Big Gulp when you pry it from my cold, dead, diabetic hands. Yesterday in court, the New York Board of Health’s lawyers argued in favor of the policy, noting that sugary drinks are the largest source of added sugar in the American diet, accounting for 40% of added sugar intake. They also pointed out that the measure isn’t actually a ban, it’s a size limit on 16 oz or larger cups. New Yorkers could still exercise their God given right to ingest 16 oz of soda by buying two 8 oz cups. The plaintiffs—a group of restaurants, theater owners, beverage companies and small stores—argued that the Board of Health is overstepping its authority, and the American Beverage Association has said the ban would hurt businesses. A ruling is not expected until next month.